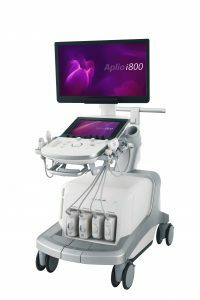 CHICAGO, Nov. 26, 2018 – Expanding its advanced, high-performing Aplio™ i-series ultrasound platform, today Canon Medical Systems USA, Inc. introduces the industry’s first 33 MHz ultra-high frequency linear iDMS transducer, providing extremely fine detail in the near field and the highest frequency on the market. The ultra-high frequency transducer uses iDMS technology and a single crystal wide band to provide superb resolution and detail in ultrasound imaging. Canon Medical Systems USA, Inc. introduces the industry’s first 33 MHz ultra-high frequency linear iDMS transducer, providing extremely fine detail in the near field and the highest frequency on the market. The new transducer extends the existing lineup of transducers currently available in the Aplio i-series ultrasound platform and is ideal for superficial subcutaneous imaging, carotid exams in pediatrics and pediatric/neonates, superficial nerves and superficial vascular evaluations such as varicose veins. The all-new 33 MHz ultra-high frequency transducer, available on the premium Aplio i800, is currently being showcased at this year’s Radiological Society of North America (RSNA) annual meeting in Chicago, November 25 – 30, 2018 (Booth #1938, South Level 3).